I have examined the data of Lago di Fosses from October to December in the period when the data logger worked (with snow, without snow, before and after days with temperatures below -10°C when the lake could has been frozen) but I have found nothing of interesting. In fact it is not easy to analyze and understand the few cases with snow at ground and "black ice" on the lake. About you theory of the air circulation triggered by the difference of radiation balance between the frozen lake (without snow) and the surrounding meadows covered by snow, I think it is credible, but it is probably very weak and not so strong to influence the radiation cooling of that huge frost hollow. But, you know, we should do an accurate monitoring of temperatures and winds there, to have the answer. Anyway, I'm looking forward to hearing your news from Lake Sämtis! Amazing results! The Hintergräppelen one, especially, is very significative due to its modest altitude. Hintergräppelen is definitely a good frost hollow, also considering, as Gasgallo said, it is located at middle elevation. 3 - as soon as the sun began to go down the temperature has begun to drop continuosly (already -36°C at 6pm) until late evening, when the cooling stopped (minimum temperature of the night was -38.2°C around 9-10pm). In fact all night long temperature remained stable between 37.0°C and 37.4°C. This has been probably caused by a considerable mild and dry advection above the frost hollow, especially between 1500 and 2500 m. Milder air aloft could have increase the downward longwave radiation of the sky, that would have block the further cooling of airmass enclosed in the hollow. - Wind was not an issue in the night from January 5thto January 6th, it’s the clearing of the clouds after 4am UTC which lead to ideal radiation conditions. 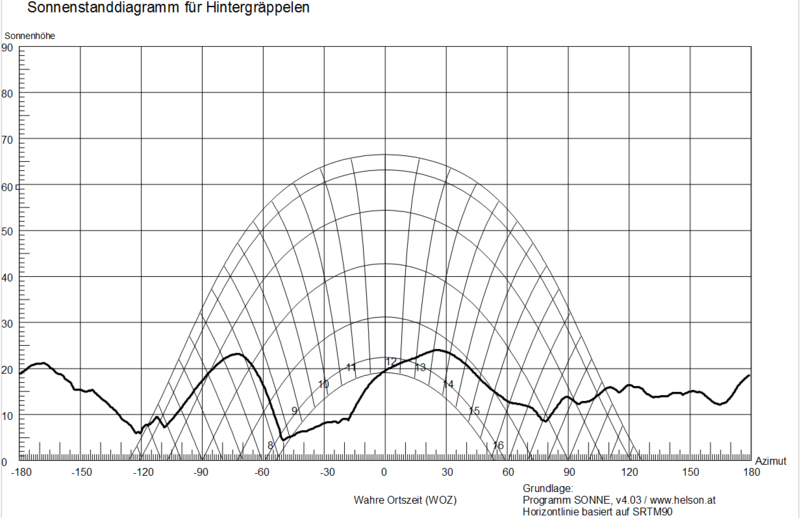 - There is an interesting difference between Hintergräppelen and Lake Sämtis regarding the diurnal variation of temperature.Hintergräppelen has a rise of around 5 K, while at Lake Sämtis thelow-frequency amplitude is smaller. I see the reason in the differentmorphology of the frost hollows: Hintergräppelen has more of an open, smooth bowl while Lake Sämtis has steeper slopes and is shaded by higher mountains on the south side. With this configuration, Hintergräppelen receives more sun than Lake Sämtis. - Advection of warmer air has been observed at two nearby weatherstationson mountain tops. Säntis at 2500 m is some 7 km and Hörnli at 1144 m some 30 km away. Both are representative for the free atmosphere. 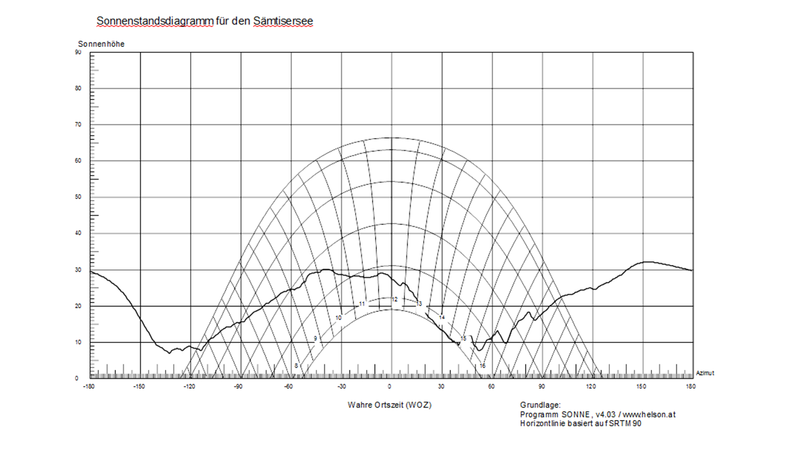 At Säntis advection of warmer air started on January 6th at 9 UTC. Starting from -22 °C the temperature climbed to -12 °C on January 7th at 6 UTC. At Hörnli advection of warm air started at January 7th 0 UTC. Here the temperature climbed from -13 °C to -5 °C 12h later. - The high-frequency variation of the temperature at Hintergräppelen is generally smaller than at Lake Sämtis. I already mentioned the higher relief energy at Lake Sämtis. I think that this leads to more cold air avalanches from the slopes, resulting in a turbulent mixture of the cold air pool. Hintergräppelen on the other hand comes to an almost rest with almostn o fluctuation of the temperature for several hours. Morphology is one part ofthe explanation, advection of warmer air a second one and a third one is the increasing cloudiness. I had supposed that Hintergräppelen's bottom gets more sun than Lake Sämtis, but I am surprised about only 5°C raising temperature in that day. About high-frequency variations of temperature at Lake Sämtis, I think they has been caused by light downslope breezes instead by cold air avalanches. In fact the latter normally causes bigger increases temperature, up to 5-10°C, as recorded in a couple of frost holllows that I monitored. 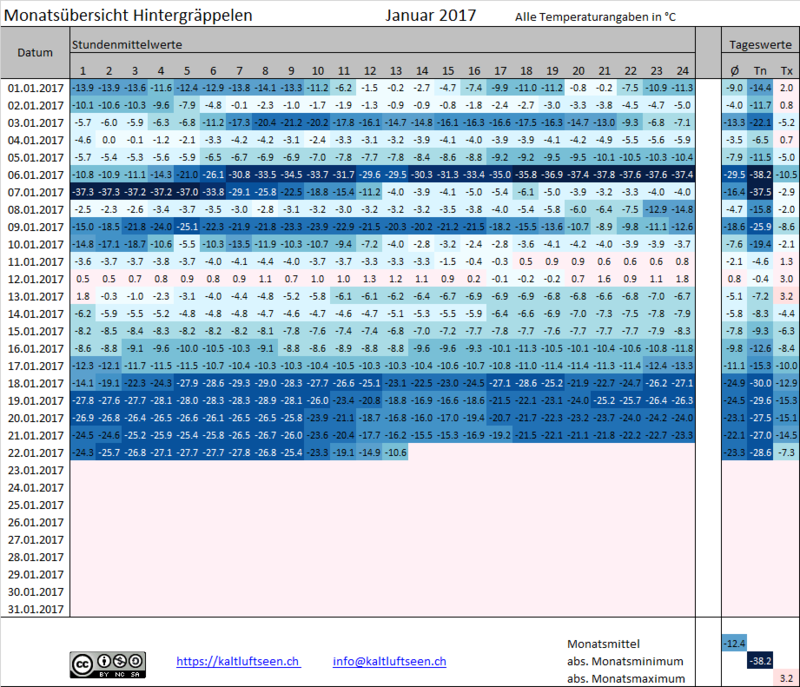 On January 6th Hintergräppelen has "cooled down" its air mass around 25°C, comparing the temperature in free atmosphere at the same elevation (according to the soundings of Payerne and Muenchen). It is a good value but in perfect radiation conditions it can reach 30-35°C. But you know, you normally have nocturnal perfect condition in high pressure situation, with calm winds, very dry air during the day and clear sky. During a cold wave it's rare to have these conditions. Hi Bruno, thanks for sharing your knowledge regarding the high-frequency variations!